First of all thanks for visiting MattCarstens.com. This site is where I am going to take on some independent reporting projects, integrate my thoughts into those projects and post stories I've written for other news outlets. Make sure to comment and enjoy! As most of you probably know Mariner color commentator Mike Blowers was arrested a few months ago for a DUI in Peirce County. The reports came out nearly a month after the incident occurred with KING 5 getting the scoop. The next day Geoff Baker did his due diligence with a little tidbit at the bottom of his Figgins to 3B story where the Mariners media relations staff told him they had no plans to punish Blowers and that he had learned his lesson. About 20 days after that the M's were hit with another DUI case, this time non-roster invite Adam Kennedy. Kennedy, however didn't hide from the arrest. 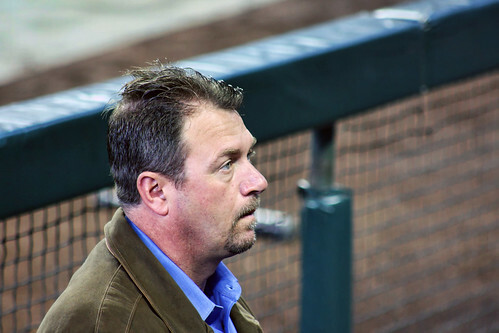 Kennedy called nearly every Mariner beat reporter and gave them all individual interviews. He came surprisingly forward which I think a lot of people appreciated. That is the kind of behavior I would have expected from someone that is a long time part of the Mariner family, not a non-roster invitee. Since there wasn't much looked into Blowers' case I thought I'd order the police report and find out some of the details. Blowers was arrested Dec. 2 at 12:55 a.m. According to the police report he was traveling eastbound on SR 512. "I observed a vehicle ahead of me (approximately 1/2 mile) traveling in lane two of three, suddenly began swerving into lane three then back into lane two," Officer Sherman J. Fox said in his police report. "As I closed the distance between his vehicle and mine, I observed the vehicle (I was now close enough to identify the vehicle as a black Chevy Tahoe) continue to swerve into lane three. As we approached the Golden Given underpass, I observed the Tahoe swerve almost completely onto the right shoulder (the driver's side wheels were on the fog line), and traveled there for approximately 1/2 mile before drifting back into lane one. At [12:57 a.m.], I activated my emergency lights and the Tahoe pulled over on the right shoulder at the Golden Given Underpass." According to the pre-arrest observations Fox noticed Blowers had bloodshot, watery eyes with an obvious odor of intoxicants on his breath. After admitting that he had been drinking, Blowers was placed under arrest 1:08 a.m. and was taken to the State Patrol office in Tacoma. At the office Blowers called his lawyer and his lawyer told the police that he would not be answering to any more questions, but would submit to the blood alcohol content (BAC) test. Blowers was administered the two tests at 2:03 a.m., one registering at .140 and the other at .139. He was then picked up by a friend 40 minutes later. "Gross motor impairment and lack of physical control. Blurred vision and major loss of balance. Euphoria is reduced and dysphoria." As mentioned above Blowers has not issued a statement. The Mariners have just mentioned that he expressed regret. Welcome to Matt Carstens dot com. Here you can find my Resume and Portfolio above, as well as my occasional thoughts on the blog. Matt Carstens dot Com. Designed by Matt Carstens, NodeThirtyThree and Free CSS Templates. Blogger Template by Chica Blogger.